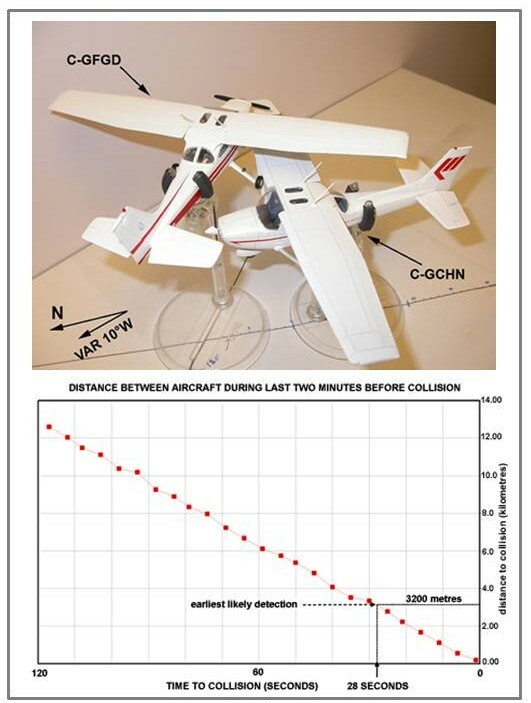 DVI Aviation has investigated numerous accidents involving mid air collisions. Most investigations include elements related to determining the collision geometry, finding witness marks on the wreckages (paint transfer, scraches, or other damage), evaluating aircraft conspicuity, performing cockpit visibility studies, and estimating pilot reaction times. Other items of interest can include a) Windshield condition- clean, dirty, bug guts, crazed, obstructed locations, etc., b) Filament analysis on exterior and interior lights, c) Position of pilot and copilot seats, condition of locking pins in their seat tracks, seat back and seat height settings, d) Sun position, e) Radio transmissions, and e) Other cockpit distractions.